I began my career designing highways and after five years it was clear that more lanes did not equal less traffic. Working on projects that give people alternative modes to travel and promote an active lifestyle has given me a renewed sense of accomplishment. I truly enjoy working on projects that are improving the quality of life for people in our communities. Adrian has over 20 years of transportation engineering experience working in designing roadway, bicycle, pedestrian, and trail projects. His expertise is in managing multi-discipline projects from planning through design and construction. In addition to his engineering design skills, he is a certified as a Project Management Professional with extensive experience in coordinating and facilitation resolution of project issues by monitoring projects risks and developing mitigation plans. Adrian offers a comprehensive knowledge of LEED® Building Design and Construction and Neighborhood Development requirements, as well as all stages of project bidding and construction management phases. He is known by clients for his high quality work, excellent professional ethics, leadership skills, accountability, and decision-making capabilities. He is a graduate from the University of California, Berkeley (1996) with a B.S. 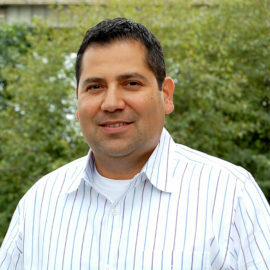 in Civil Engineering and from the University of Oregon (2004) with an MBA.